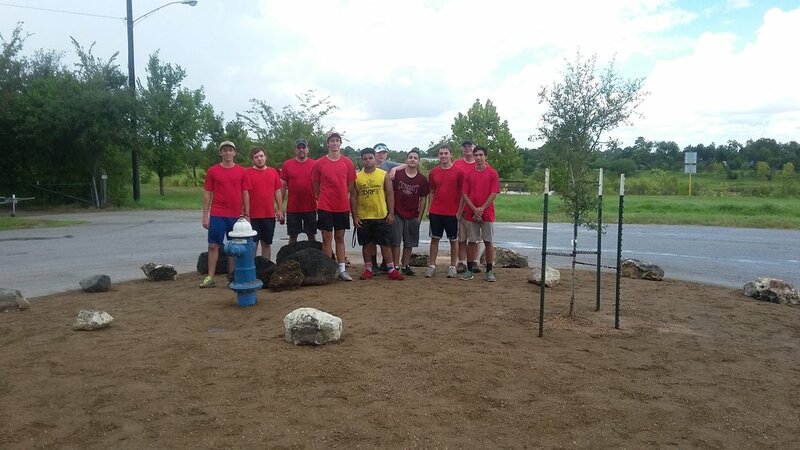 On September 24th, Mitchell Mezyk, a scout with St. Thomas More Troop 99, completed a landscaping transformation of the traffic circle on South Clematis Lane near Gasmer Drive. The site is on the banks of Levitt Lake opposite where the future music pavilion is planned and is an entry point into the Willow Waterhole Greenway. This is the second project traffic circle on Clematis transformed by Eagle Scouts. Both were weedy and potholed, attached are the before and after photos for Mitchell’s, it is now a beautiful xeriscape. Mitchell spent one day preparing the site; mowing, killing weeds, and leveling. The second day he and his fellow scouts from Troop 99 planted a live oak tree, put down weedblock, spread crushed granite, and placed boulders around the circle. Mitchell and his father made a trip to Fredericksburg to get the boulders, the tree was donated by Trees for Houston, and crushed granite by the Willow Waterhole Greenspace Conservancy. Mitchell raised funds to purchase weed killer, weedblock, additional crushed granite, and lunch for the troop.